C-EB’s prom was a success, with young men and women from not only C-EB High School, but students invited from schools across the reservation and from other reservations in the state. Students and staff dazzled parents and each other with their elegant 1920’s dressed and suits, hairstyles and accessories. The junior class showed themselves and the seniors how simplicity can be beautiful. Winners of the Lord and Lady contest were Steve Beckler and Lexi Keckler. Winners of the Prince and Princess contest were Nevyn Mendoza and Taylor Uses the Knife. 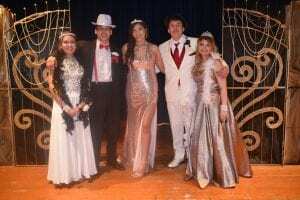 After the seventy-seven couples made their way across the stage during the Grand March, Junior Advisor Monica Eisenbraun announced the evening’s royalty. Above are Princess Taylor Uses the Knife, King Cecelio Montgomery, Queen Jayden Hollow Horn, Prince Nevyn Mendoza and Queen Demi Lends His Horse.